Bray. A pretty little village on the river Thames in England that boasts half of the four triple Michelin star restaurants in the UK and two one star pubs all within the throw of a filet mignon of each other. Yep, Bray is an inexplicable culinary wonder. So, while Heston Bluementhals world famous Fat Duck was closed for refurb, we chose his pub, with it’s Michelin star and three AA rosettes, sat literally across the road from all the secretive quacking, drilling and sawing. The Hinds Head is old. This 15th century inn was pulling pints before America was discovered. But the interior has been thankfully saved from looking all 'Weatherspoons' and little interesting details are everywhere. Detail - it's what Heston is famous for. Well, and bacon and egg ice cream. Urgh! 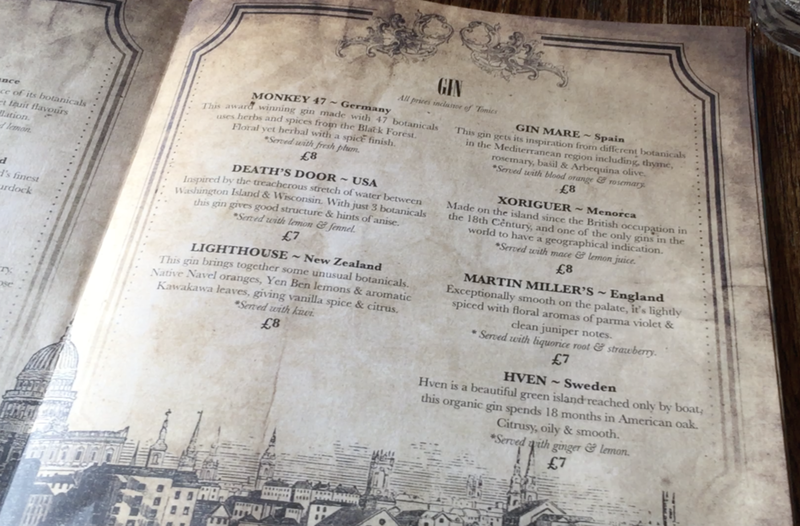 The drinks menu included a fashionable array of fancy gins. I’m so glad gin's back in fashion. Vodka always was overrated! The restaurant itself is cosy but not too crowded. There’s nothing worse than being bombarded by an over-chatty couple next to you. There's plenty to choose from. The problem is - what do you choose? The lunch menu was homely and easy to understand, which surprised me. None of Heston's signature mysteries here, much to my mild disappointment. I was expecting to have to decipher some weird, wonderful Willie Wonker style dishes. For main, we both had the cod and crab lasagne, which looked no more special than any other pub lasagne, but the taste thankfully transcended its humble looks. Looks ordinary - tastes anything but! For dessert, the chocolate wine slush with millionaires shortbread, once on the menu of The Fat Duck before it went all ‘taster' on us, at last captured my imagination. The slush was odd, it’s flavour unexpected given its colour and the gold crusted shortbread was dark and not over sweet. The quaking pudding looked like a mouldy pannacotta but thankfully didn’t taste like one. It was warm, and cuddled your tongue with wintery spices. Do REAL millionaires eat gold nuggets? The quaking pudding looked like a mouldy pannacotta but thankfully didn’t taste like one. It was warm, and cuddled your tongue with wintery spices. I still find it odd having Michelin starred pub grub, but it’s the food that matters most and the atmosphere here a lot more refined than your typical boozer. It gets nine for the food and service and we even got given a Heston signed menu from our lunch, but I’ve knock off a point for the ordinary presentation of the main course. It just wasn’t ‘Heston’ enough. If you enjoy fine dining take a look at our review of London restaurant Galvin at Windows.